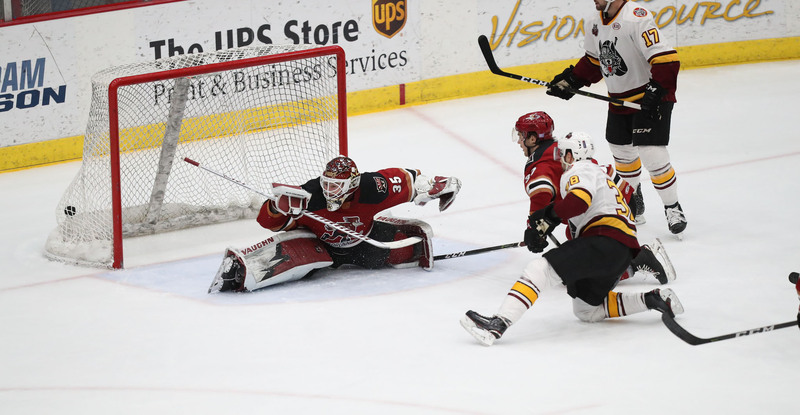 The Roadrunners fell to a high-powered Chicago Wolves club Friday night at Tucson Arena by a 6-3 score. One of the American Hockey League’s best teams to start, and especially so on the road, Chicago struck for four first period goals, including three in a 2:37 span to take a steep lead from the get-go. Calvin Pickard, making his third consecutive start as he nears the end of his conditioning assignment from the Arizona Coyotes, was pulled 9:40 into the contest after allowing three goals on seven shots. The Roadrunners, hindered by a poor start, found themselves in a deep hole heading into the first intermission. With 3:32 left to play in the second period, Lane Pederson struck for his team-leading 10th goal of the season to get the Roadrunners on the board. Pederson’s goal, the result of a quick release after cutting to the slot and letting go with a shot against the grain, now has points in six of his last seven games, including four goals. 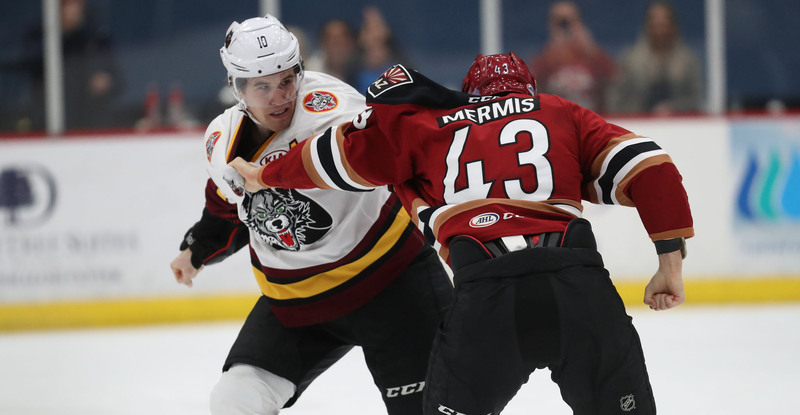 Just over two minutes into the third, Nick Merkley got the Roadrunners within two when he jammed home his fourth goal of the season, following up a Domenic Alberga shot that trickled through Oscar Dansk’s pads after the two sped in on an odd-man rush. With 12:56 left on the clock, Steenbergen deposited a wrist-shot into the net from the high slot, scoring his sixth goal of the season to get the Roadrunners to within one, cutting the score to 4-3. A mere 1:19 later, the Wolves would respond on a power play to reclaim a two-goal lead. Chicago added an empty-net tally with 1:15 to play to secure its 6-3 win. Hunter Miska stopped 20 of the 22 shots he faced in relief of Pickard. Merkley finished the night with a goal and an assist, registering his third multi-point performance in the last five games. The second-year forward now has 11 points (4G, 7A) in 10 games played this season. The teams will meet for the final time this regular season on Saturday night at Tucson Arena, where the puck is scheduled to drop just after 7:05 PM.